online: 75 | playing: 15 Play a new game Records Music ? Improve ? Alyabyevs most famous work is The Nightingale (Соловей), a song based on a poem by Anton Delvig. 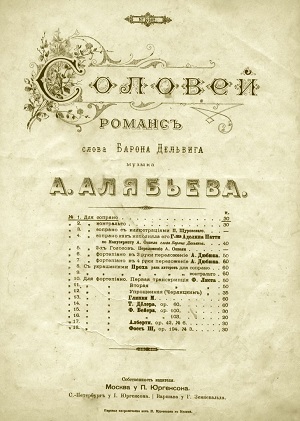 It was composed while Alyabyev was in prison, in 1825. It has entered Russian consciousness as akin to a folk song. * The fragment of "Alexander Alyabyev. The Nightingale" is presented exclusively for information purposes.